For my birthday, we headed to Benagil beach - a gorgeous, small beach surrounded by limestone cliffs, and famous for its series of limestone caves. We booked our boat tour of the caves when we arrived, and as we had several hours to wait, we headed to the beach. This stunning beach captured my senses as soon as I arrived. The dozens of yellow-orange hues of the limestone cliffs caught the sun and made a vivid contrast to the sparkling blue and turquoise waters they sheltered. We didn't waste any time and quickly made our way into the famed warm waters of the Algarve. The waves were gentle here, and we were able to relax and swim leisurely back and forth, looking up at the cove of limestone cliffs that surrounded us. Soon we noticed that there were some people swimming around the corner of the cliffs. Aprehensive at first, we decided to follow them into the deeper, slightly more churned waters and peek around the corner. It was the caves! Even though we were taking a boat tour to them later, we wouldn't get to get out and experience them, so we were very tempted to swim the rest of the way in. Everyone else was doing it - surely it was safe? My heart wanted it and my mind didn't - but J was already ahead of me and the heart won out. We swam through the bouncing waves (not really too bad, in the end - you just need to be a strong swimmer) and pushed our way against their pulling until we finally were able to step onto the shore. These incredible caves have a soft sandy beach inside - and a hole in the top to let in the sun. Fascinated, we walked through the caves and joined some of the people that had set themselves up under this large circle of sunlight. We warmed ourselves up and rested in this spot, while looking around at the utter, eerie beauty of the caves. We did a lot of things in the Algarve, and saw a lot of beaches, but those fifteen minutes we spent in the caves were by far my favourite part. Something about swimming to the caves and 'discovering' them ourselves made them feel even more special than they already were. The boat tour was also incredible - one hour of being taken around the various caves in the area by a very skilled boat driver. I will admit I shrieked more than once and clutched the railing unnecessarily tightly as he wove in and out of caves at sometimes terrifying speeds, but it was all worth it for the experience. We were driven through tight, narrow spaces and emerged from the dark on the other side; we saw caves with holes in their ceilings, from heart shapes to two 'eyes' looking down at us; we saw secluded limestone beaches and other beaches full of people that had many caves to explore. After Benagil, we headed to the nearby beach of Marinha. It's only a five minute drive from Benagil, so it's easy to experience both in a day. Marinha is also a beach of limestone cliffs and caves and has been voted one of Europe's ten best beaches and one of the world's top 100 most beautiful beaches. As we descended the long steep steps and slope to the beach, we could see why. This incredible beach is scattered with cliffs, rocks, and caves everywhere you look. At high tide, you have to wade through the water around a part of cliff that sticks out, in order to access the rest of the beach on the other side. Backpacks high on our back and timing the waves just right, this is what we did. What emerged was even more beautiful than what we had seen from above. People were swimming amidst the large formations, lying in the shade in nooks and crannies of the cliffs themselves, hopping from one rock to another, exploring small caves, crawling up and over the rocks and under an archway to access yet a third part of the beach, and generally just enjoying this little slice of paradise. Entranced, J and I slid into the water and swam around, unable to keep our eyes off the pure beauty that surrounded us. Photos don't really do these places justice. I fear my words don't, either. I'm absorbing so much beauty that I fear my ability to translate it just isn't coming across the way I want it to. Come to Portugal, and experience it for yourself. The next day, we drove an hour west and visited Sagres and the nearby Sagres Fortress. It is thought that Prince Henry the Navigator's navigation school from the 1400's was located here. There are many historic bits and pieces located here, from a small church still standing from Prince Henry's time, to various other buildings and fortress details that were built over time. My favourite was a 43m in diameter compass rose made out of perfectly arranged rocks embedded into the ground. The views from here were incredible - wild waves off one side of the cliffs, and calm, barely moving waters on the other side. There was even a small beach at the bottom of one that you could carefully hike down the cliffs to access, but by the time we finished our walk around exploring, the tide had come in and the small little 'beach' was almost gone. We headed to another nearby beach instead (Martinhal), which also had fairly calm waters but heavy, relentless winds. The locals had set up elaborate shelters of umbrellas half-burried in sand, but we weren't so lucky. Sand-covered and cold, we nevertheless made our way over to the south-western most point of Europe (Cabo S. Vincente, or Cape St. Vincent). The views from here were also breath-taking. I can't help comparing some of these places to what we experienced in New Zealand. Some of the landscape is similar, but the way that countries deal with them are very different. While in New Zealand most of these places were remote, wild, inaccessible, and protected, Portugal does things a little differently. Fisherman perch themselves over the fences that say "Danger - cliff erosion" with little concern and set up their rods for the day; fences have intentional breaks built into them so you can go past them to the 'dangerous' part and look over the cliffs if you wish; and small carts are set up cliff-side to sell you pasteis de nata, blankets, and even postcards. We of course get the obligatory tarts, and perch ourselves on a rock looking over the never-ending ocean. I read bits of translated Portuguese poetry, history, and legends to J while we sit on the wind-swept cliffs and try not to get blown away. This place has been used for spiritual purposes since Neolithic times. Ancient people's would gather here; Romans and Greeks set up temples and believed it to be the "end of the world" - with the infinite sea beyond; monks have even set up a monastery here. Today, it is simply a place to come and visit, take walks around the cliffs, enjoy the views... and, if you stay late enough, enjoy the sunset. That had been our plan, so we set about finding a good spot to sit. We found one as close to the edge as I would allow us to sit, and wrapped ourselves in sweaters and beach towels to await the sinking of the sun into the sea. Gulls floated up and sank down at dizzying speeds; the wind fluttered our towels and blew our hair around, and more and more people started to arrive. It was an interesting phenomenon - all these people driving to the tip of a country, perching themselves on cliffs, simply to watch the sunset. There was laughter, eating, drinking, but also a lot of quiet. There were at least over 100 of us. Something about this communal gathering of people to witness something like the simple setting of the sun really moved me. You could hear various different languages being spoken; people were of all ages; all cultures. And yet there we all were, silently united by this one simple yet incredible thing - watching our sun slowly disappear into the endless sea. When the sun finally did set, glowing orange and large, then the last sliver slowly disappearing into the blue horizon, another curious yet moving thing happened - all around the cliffs, from end to end, people started spontaneously clapping. A little taken aback, J and I looked at each other, then started clapping, too. Usually applause is meant to indicate appreciation, celebration - but there is an intended listener. In this case, there was no listener. It made me think back to the Cromlech/standing stones that we saw near Évora. In ancient times, people who gather with those stone circles and celebrate the solstice and other important movements of the sun. And here we were, a spontaneous assortment of humanity, tourists and locals from all over, gathered at the 'end of the world' to watch the setting of the sun. Perhaps our applause was simply that - a spontaneous expression of our unity with each other and with the beauty of the world we were all witnessing together. And yes, I had tears in my eyes. I couldn't help it. Our last day in the Algarve found us back at Marinha beach. The warm waters and incredible limestone formations beckoned us once more, and we couldn't resist another swim before heading on our way back north to Lisbon. We did make one more final stop on the border of Algarve - the beautiful beach of Odeceixe, where a large beach of pillowy-soft sand stretches between two towering rocky cliffs, and you can walk right up to the nearby river and watch it empty itself into the sea. The waters were very shallow but the waves incredibly strong; we spent our last beach day trying to catch these waves as they crashed and pulled against us. We rode them with varying degrees of success, laughing and giggling at them and each other. It was a moment of pure joy, where all our senses were focused on nothing but crashing water and staying upright. We reluctantly pulled ourselves away from Odeceixe beach and said goodbye to this beautiful province that gave us so much more than we ever expected. Until next time, Algarve. Today's mission was to drive from Serra da Estrela all the way down to Algarve, the most southern province. We wanted to pass through the historic town of Évora, though, which we knew was going to take more time. We left the mountains as early as we could, and headed south. After descending the mountain range, we eventually reached the flat terrain of the Alentejo provinces. The difference in terrain is a surprise, after so much mountain driving, and we can't take our eyes off the seemingly endless fields of olive trees and vineyards. After a few hours of this, we eventually reach Évora - the walled city. In the medieval era, the city was entirely surrounded by walls. Much of these walls are still preserved, so driving into the city feels quite special and unique - as if you are entering a fortress still frozen in time. Scattered in the heart of the city are buildings of varying ages and periods in history. We only have a few hours to spend here, so we don't go in any of them, but rather wander around the intricate streets and alleys, lingering here and there and simply stumbling upon bits of history. A chapel here, a few old stone arches there. There was even, behind a chained fence, a handful of mysterious, un-marked columns and other clearly very old crumbling ruins. build our homes around them. The city is alive with layers upon layers of history. We don't have time to learn and aborb it all, but as we walk around, we definitely feel it. The crowing jewel of these various historic remnants is the Roman Temple built for the goddess Diana. There in the middle of the city it lies, quietly, standing tall and proud, despite its state of disrepair. It seems oddly out of place, with the bustle of modern-day pedestrians walking around taking photos, a small outdoor cafe just steps from it, and various vehicles parked nearby. To me it felt strangely sad and beautiful at the same time; remnants of an ancient civilization, standing here untouched in the middle of modern-day Europe. So many other peoples have come and gone through here over the centuries, and yet Diana's temple remains, though so far away from its former glory and purpose. As I stare up at those intricately designed columns, I again try and imagine it the way it may have once been. Today it's harder than usual, it feels. Especially with the chattering of coffee drinkers at the cafe behind me. I can't make up my mind on whether it's beautiful that this is still preserved here, amidst the modern city that must go on, or sad that it is not somehow more secluded and set apart from the mundane of every day life, the way it once may have been. But that is Portugal, it seems. There is so much physical history everywhere that sometimes you feel as if you can't turn around without stumbling over another ruin, another plaque reminding you of what was once here. Not everything can be preserved in a vacuum, and Évora, at least, does a fascinating job of integrating the old with the new. Another highlight of the trip into Évora is the Fabrica dos Pasteis (Custard-tart factory). We wandered in to a small front shop that serves only pasteis and a few other Portuguese tarts, fresh out of the oven. We ordered a selection of a few. The custard tarts are so fresh that the woman serving us can barely touch them as they are so hot. We sit down at one of their cozy tables with our box of treats and an espresso, and dove in. The pasteis were... magical. While most non-Portuguese people seem to be obsessed with them, they're not my first choice off any desert table, but these were something else entirely. The crust, still hot, flaked perfectly in layers as you bit into it, and the custard itself was thick and creamy, oozing out softly as you bit into it. The taste was subtly but deliciously different than any other pastel either of us has ever eaten. To quote J - "This is the best place to have pasteis de nata in all of Portugal." As we've tried one in almost every town we've been in, she may very well be right. Another place we visited while near Évora was the Cromlech of the Almendres - in other words, Portugal's "stonehenge". Yes, you read that right. The UK is not the only place in the world to have these fascinating and ancient arrangements of stone circles. The ones near Évora are dated back to 6000 - 4000 BC. We walked around them slowly, taking in the presence of these large rocks, placed upright by people from a time and world so much different than ours. The people and their histories and spiritual beliefs are long gone, erased by time, but these stones remain. The whole space seems sacred, somehow - especially since this little spot is so out of the way. A handful of people wander by and take a few photos, but they quickly leave, and we have the stones to ourselves for a long period of time. I try and imagine people gathering here, to watch the sun during the summer solstice. Were they quiet? Did they joyfully celebrate? Did they eat, or sing, or dance? Did they say anything to each other? These are impossible questions. Still, we ask them, and imagine... I place both my hands on a stone and lean in, trying to feel the answers, perhaps, but none come. We reluctantly walk back to our car, while a solitary man goes into the centre of the stones and sits on a flat one in the middle, just looking up at the sky. We leave him to his imaginings, for it's his turn to have the circle to himself, and make his own connection, as we did, to people from long ago. We left Porto on a quiet Saturday morning and headed inland towards Serra da Estrela. When I was a child, my Portuguese teacher would talk about this place as if it were a magical land of legends (or so it sounded to my young ears). It impressed upon me a desire to one day see it in person - how could you not want to visit a place that translates to "Star Mountains"? The roads, like the ones in Gerês, were full of sharp turns and snaked increasingly upwards. In certain parts they were narrower than we would have liked, but J is growing increasingly comfortable with Portuguese driving and we smoothly rose further up into the mountains. In winter, the landscape would be covered in lovely snow caps, but summer brings its own treasures. Our first stop at a viewpoint revealed not only a breathtaking landscape of jagged peaks, lush green plants of various shades, and a sparkling blue sky, but also delicate and colourful mountain butterflies that flitted everywhere we looked. Buttercup yellows, white with intricate black streaks, and even tiny rainbow-coloured ones fluttered around us from flower to flower. Entranced, I chased them around for a bit with my camera, trying to capture their ephemeral magic, before I reluctantly returned to the car. Our accommodations for the night were in Manteigas, a small mountain town, so we headed there to drop off our bags and then continue on to one of the trails. Poço do Inferno (a waterfall) was our target, so we acquired a trail map from the hotel front desk and were on our way. The start of the trail was well indicated, so up we went - this time, with hiking boots... lest this be another flip-flop fiasco! The terrain grew increasingly more challenging, and we straddled boulders, balanced precariously on steep inclines and tried in vain to find the trail. We had read on the internet that Portugal is notoriously bad for trail markers, and we seemed to be experiencing it already. No more than a few minutes into the hike and we were already likely off the trail and just wandering in the mountains. I did hear the sound of falling water, though, so I persisted in forging some sort of path where there was none, and J followed cautiously behind me. I stood up on a boulder to get a better view below. And there it was - something that looked indeed like the Poço do Inferno. The small waterfall tumbled over boulders and into a lovely clear, green-coloured pool. We perched ourselves on some nearby rocks and enjoyed taking off our hiking boots and letting our feet dangle in the cool water. We didn't really feel the need to go any further, and spent a good half hour just sitting in the mountains. We felt very far away from the reset of the world. Our secret little waterfall. Later, we descended back down the way we came instead of trying to locate the non-existent trail markers, and explored a bit further down the road from the parking area. We discovered the real poço do Inferno - very similar to what we had found, but a bigger version. We took the stairs up for a better look. There were large boulders around this one that made perfect seats, so again we set up camp on the boulders and just sat watching the water fall and enjoying the bright green pool it was pouring into. Tourists came and went - snapped their photos, took their selfies, and moved on, while the waterfall remained ours. We've found that if we wait long enough, we can wait out whoever is briefly visiting whatever spot we happen to want all to ourselves. It gives us a slower, deeper appreciation for where we are. Sure, we take the photos too - of course. But there's more than that. I want to memorize the sight of fluttering rainbow butterflies landing on pale lavender wildflowers; the sound of water tumbling from high in the mountains into a crystal green pool; the scent of pure mountain air. I want to take more than a photo, I want to somehow capture the entire experience and take it home with me. And the only way to do that is to immerse ourselves - so we do. After this low-key afternoon just experiencing the mountains, we took the drive back to our accommodations in Manteigas and spent some time relaxing in the room before dinner. We had a beautiful view from our windows; a fantastic landscape of jagged layers of grey and black rocks, white houses with red-clay roofs, evergreen forests on the hills, dancing butterflies, and the scent of fresh, crisp mountain air. In my mind's eye, I try to go back in time and tell that small child who I used to be, that she will indeed get to visit 'Star Mountains' one day, and that it will be more wonderful than she could have imagined. Porto. A city of romance, of wine, of impossible dreams. We wandered around all day, taking little alleys and exploring old Porto. Ambling up old stone staircases, drinking spring water from springs, looking out at the replica old fishing boats carrying port wine. Dreams of centuries ago. Even the graffiti here is romantic, prose and make-shift poetry transcribed in thick white ink on the edges of the towering bridge that goes overtop the Douro River. We are entranced, engulfed by this lively, passionate city. It's also the eve of one of the city's biggest holidays, the festival of St. John. The streets are lined with vendors, music blares from all corners, streamers line all the streets, and the feeling of joy is in the air. We wandered into an old bookstore - over a hundred years old. The wooden twisting staircase is in the centre of the shop, and the bookshelves are deep and high. I meander slowly, ignoring the English books and heading towards my native tongue - my true native tongue. Until I was five, I knew nothing else. Portuguese was the only thing that existed, for I didn't even watch television until I was in kindergarten. My school report cards from the first few years say I was a struggling ESL student - a shock to me once I discovered them. I don't really remember not knowing English. Nevertheless I have always been proud of my Portuguese. Especially now, I can understand and communicate fluently and with ease. J is fascinated by my seeming secret power, as I translate conversations of passers-by. I picked up a Portuguese book with short stories about saudade - that longing that is uniquely Portuguese, a kind of ache of missing someone or some thing that is unlike any other feeling. It's a word that is un-translateable. In English we say "I miss you" - "miss" is a verb. In French you say "Tu me manques" - literally, "you are missing from me". In Portuguese, you say "Tenho saudades," - "I have saudades." The feeling, the sentiment, becomes a noun - something present, heavy, almost tangible, yet achingly untouchable despite its noun-status. I felt that way in the bookstore, today. I had saudades of something I've never had, never possessed. I had saudades of my own culture. All bookstores should look like this. It started innocently enough. I asked one of the women who worked in the store if she had any books from a particular author. She checked, but she didn't. She then noticed the book in my hand, and excitedly told me about her favourite authors who had contributed to the anthology. She then took me around the bookstore, passionately telling me about this or that book that I might enjoy, showing me different collections and recommending them for one reason or another. I told her I was from Canada, that my parents were from here, and that all the Portuguese books I had access to were my mother's old school books. I felt in her what Anne of Green Gables would call a kindred spirit, someone so passionate about the same things I was. She could barely contain her passion about literature and the world as she showed me books of poetry and told me all about the Portuguese psyche, how they are one of the world's largest consumers of antidepressants and no one knows why, about how even she herself hasn't taken them yet but feels the tiredness, the vague aches and pains, that seem to be almost a rite of passage to being Portuguese, at this point. In her young voice telling me these things I saw and heard my own mother, the ache and the saudade, the longing for something indescribable and never possessed (so how could it be missed or longed for?). I heard and saw myself, too. She then told me that my Portuguese was very good for being a foreigner, even though she could tell that I was from abroad because my Portuguese has an accent. Someone had said that to me last night too, at a restaurant. An accent. A dead giveaway that you are from elsewhere. That you don't belong. To my ears, my Portuguese sounds the same as my parents and all the Portuguese people I know back home. It's a little startling to be told your own pattern of speech betrays you as a foreigner. Perhaps it shouldn't have affected me as it did, but as I exited the bookstore with the two recommendations the kindred spirit had given me, I felt such a sense of loss and buried my head in J's shoulder. You cannot explain saudade in words. It is something you carry with you, that makes you who you are and colours everything about what you do and how you feel life. I was born abroad. This is not my country. As much as I hold it dear and feel a connection to so much of it, I grieve a loss of something I never had - a culture that in some other life, some other parallel universe, would have been intimately mine had my parents not boarded a plane and started their life in a new country, so far from everything they knew. In some ways my saudade is theirs, too. The Portugal I know and love is not the Portugal that exists today. It is the country of my parents' stories, the slower, different times from long ago. I remember as a child, my parents took us on a hike to the big natural spring that everyone used to get water from. The way was covered in brush and difficult to access (unlike the easy access from long ago when people tended the paths because retrieving water here was a necessity), but we finally got there. As we drank water from the spring, I remember my father saying to my mother, quietly, in such a still, aching voice that even I felt the sadness of it: "This isn't the Portugal that we left." "No, it isn't," my mother said equally as quietly. Nothing else was said, but it made a deep impression on me. What they left behind can never be regained - not by them and not by me. Culture does not stand still. It moves and grows and changes. If you are in it, you don't really notice. If you leave it and then return... a different world awaits you. This is saudade, too. The culture of a Portuguese-Canadian is one of perpetual saudade, a longing for a home that is not only far away geographically, but also in time. A longing for a place that can no longer be accessed, no matter how many times you get on that plane and go looking for it. As children of first generation immigrants, this is our birthright, too. This saudade is almost inherited. As young people we vary in how much we embrace our culture and try and hold on to our roots. Those of us that try harder can make ourselves believe, in the heart of Portuguese Toronto, amidst bakeries and sports bars and church festivals, that we are part of where our parents came from, immersed and indistinguisheable. Yet that sense of loss, of saudade, is always there, an underlying current. Perhaps it's saudades, and only saudades, that we share across geographical and generational boundaries. After leaving Old Porto, we walk back across the bridge, enjoying the stunning views of the river and surrounding towns from high up. We make our way to Calem, an old Port Wine cave where they've been making Port Wine for over a hundred years. We take a tour through the caves and learn about how they make the different types of Port, and get to see the large casks that hold impossible amounts of fermenting wine. When the tour is over, we get to sit and taste three of the ports - a dry white, a Late Bottled Vintage red, and a ten year old tawny. The tawny was my favourite - very sweet, but with an incredibly complex aftertaste of hazelnuts from being in an oak cask for ten years. After the wine tasting, we headed outside to the streets, where most of the roads were already closed off and people were starting to fill the spaces. Everywhere we walked, we could see the smoke from dozens of barbecues set up on the side of the road and smell the delicious scent of barbecued sardines. We had been forewarned by my uncle about the tradition of being hit on the head with (plastic) hammers, so we weren't surprised to see almost every other person carrying around a plastic hammer and bonking random strangers on the head as they walked along. After receiving a few dozen bonks ourselves, we decided to purchase our own hammer from one of the street vendors and are now armed and ready for the party. J takes to the practice with surprising ease, and soon she is happily walking along and bonking men, women, children, the elderly - and they're bonking her right back. After a while of this, I shyly try my hand at it. It takes a little while to get over the utter ridiculousness of it, and pretty soon I am furtively tapping people's heads and leaping away giggling. The best part is the small children, though - desperate to bonk adults on the head, they wave you over and you can bend your head down for them to tap with their hammers. Apparently this tradition initially started with long, five or six foot tall wild garlic flowers and their bulbs, but being whacked on the head with a garlic bulb hurts a lot more than a plastic hammer, so I can see why they switched over. (We did see some older women still carrying around the traditional garlic flowers and sticking them in your face to smell, instead of whacking you). We walked through the crowded streets of Porto, music filling all the street corners, and Portuguese street food enticing us from all sides. We had barbecued sardines, traditional beef sandwhiches, chourico in bread, and of course pasteis de nata. There were parts of the street we could barely push through the crowds, and the plastic hammers raining down on our heads were relentless. Everyone was smiling, shouting to each other, and having a great time. They say that Coimbra studies, Porto works, Braga prays, and Lisbon plays... but tonight, Porto was alive with the party spirit and no one held back. Portuguese religious festivals are really not religious at all, but rather a curious mix of secularism with the sacred as fringe. Some traditions, like the hitting on the head with garlic bulbs, are even said to reach back to ancient pagan rituals, their origin long forgotten. Eventually, we pull ourselves away from the festivities around 11pm and head back up to our little apartment to get ready to watch the fireworks. Most people have secured a spot near the river, but we are fortunate to have a very strategically placed accommodation. We head up the stairs and open the windows that look directly over the Douro river. The sound of the crowd's excitement, as well as the music, can be heard easily from up here, and we still feel like we're part of all the joyous celebration. Around midnight, you can hear an announcer on the loudspeaker say that the fireworks will be starting soon. The crowd cheers, and the street lamps are turned off. We wait excitedly from our bird's-eye viewpoint. Finally - the first sparks of light are thrust into the sky. We sit, mesmerized, as spectacular fireworks like I've never seen are shot into the sky from three barges strategically placed in the river. The fireworks are timed with a musical soundtrack of different popular songs, and the next half hour is a true culmination of all the joy and excitement we felt in the city all day and evening long. Porto... thank you for giving me a deeper understanding of myself. I'll be back. We said our goodbyes in the village last night and this morning, and set off for Portugal's remote north. We hadn't really planned much of this part of the trip - we only knew we were spending the next two nights in Porto, but wanted to explore some of the northern region first. We had a list of various historical places that were options, but as we drove along and discussed them, we kept being drawn back to the idea of driving through the mountainous Peneda-Gerês. The photos and descriptions in our guidebook were too good to resist, so the decision was made. As soon as we entered the mountains, I fell instantly in love. The land was strewn with boulders, as if a giant had scattered handfuls of giant marbles everywhere. Here and there, the landscape was crossed with stone walls covered in moss, that seemed to have simply grown out of the landscape on their own. The road wound through the mountains but it was manageable, and we meandered up high into the mountains, fascinated by the giant smooth rocky cliffs that soon appeared all around us. The viewpoints were incredible, and we couldn't stop ourselves from parking the car at every viewpoint and hopping out just to take a look. Our initial goal was to attempt to hike to a waterfall we had seen in our guidebook. We drove to Peneda and asked someone there about it - she indicated that there were two close by. The one accessed from Peneda itself involved a 40 minute hike, so we decided to skip it and try and find the other one that was accessed through Tibo. We snaked back through the mountains until we saw the sign for Tibo. Even though this is a National Park (Portugal's only one), there are still people living in small villages in these mountains. The villages haven't changed much since medieval times, and that became quite clear to us as we slowly descended the very narrow and very inclined road into the village of Tibo. The little stone houses were fascinating as we made turns left and right, precariously trying not to scrape the sides of the car or end up stuck at the end of a road where there was nowhere to turn around. After a few minutes of this, we realized we had no idea where we were going as the directions we'd been given were quite vague, and this tiny, frozen-in-time place certainly did not appear to have any signs indicating where to find a waterfall. I had J stop the car briefly while I walked on ahead to see if there was a place she could turn around. Thankfully, I found one, so we used it to turn the car around and drive back up the steep narrow roads to reach the main road - but not before I glimpsed, at the side of one of the stone homes, a pair of medieval granaries. I gasped, stunned that something so ancient could be just sitting right here, beside someone's home (which was probably equally as ancient), rather than in a museum or a protected area (like the granaries we saw at the Moorish Castle in Sintra). What must it be like to live literally side by side with such ancient history? The people of Peneda-Gerês have been doing it for centuries, so I suppose it is just a part of the way things are for them. We read that other villages in these mountains also have stone granaries in them, so this just wasn't a one-off. The whole region is a fascinating blend of the ancient and the modern, the wild and the human, co-existing with precarious balance since before recorded time. On our way back, we decided to stop at one of the viewpoints we had loved on the way in. We parked the car, grabbed some fruit and went to sit on a large boulder amidst the mountains, looking down at the Douro valley and river, and sharing the mountain air and sunshine with a handful of wild horses and their colts. Yes, wild horses. The garrano horse is an endangered breed of horse that freely roams the mountains of Gerês. As of 2010, the population of these animals was estimated at around 2000, so catching a glimpse of one is considered special. We were lucky enough to see five adults, as well as four colts. I couldn't have been more entranced - it's certainly one of the highlights of this trip so far. There's something about just sitting and experiencing a place, rather than rushing around to "see" as many "things" as possible, so that's what we did - just sat on the rock, ate plums, and looked out at the mountains and the wild horses feeding on the grass. We didn't talk much, for we were too entranced with the impossible beauty in front of us. The Douro river appeared still and pale blue in the distance, cutting through the bottom of the ravine with barely visible pale green vinneyards surrounding it. The rocky, jagged mountains surrounded us completely, simultaneously sheltering and imposing. The skinny legs of the light brown colts as they walked around unsteadily after their mothers was too endearing to take my eyes off of, and the calm of their chestnut brown parents completed the pastoral scene. Something of this place will stay with me always. Day 6 - Coimbra & Conímbriga. Part university town and part world heritage site, we knew we couldn't get to know the whole city in just a day trip, so the reflections here are just that - fractal impressions of a city that even we could tell has rich, multi-layers of culture. Our first stop was the University itself. Established in 1290, it is the oldest university in the Portuguese-speaking world. The highlight of our tour of this place was the Baroque library (Joanine Library). Built between 1717 and 1728, it is one of the richest libraries in all of Europe. Walking in, you certainly feel it. The intricate wood paneling and and painted gold gives the place an otherworldly feel. The books are all carefully locked away, but we can peer through the mesh and read some of their Latin titles. They are mostly hard-covered brown books of varying thicknesses. 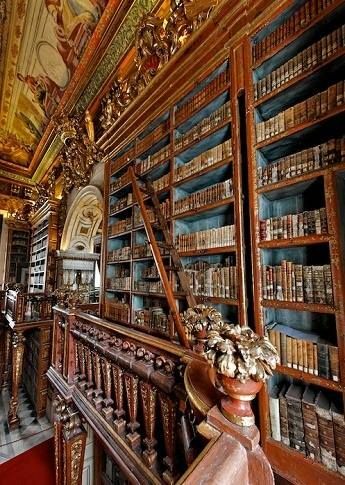 The worlds of knowledge contained inside is baffling to think about - it contains over 56,000 books from the sixteenth to eighteenth centuries. The library itself was built on the remains of an old medieval prison, which you can also descend into and tour. We didn't seem them, but bats inhabit the library and they are quite welcome because they eat any insects inside that might threaten the books. 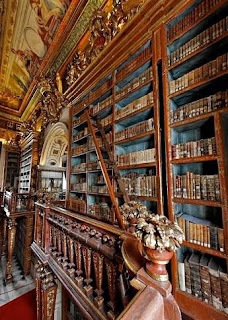 A fascinating form of pest control, and it just adds to the mystique of this old library. Our lunch stop is a modern cafe called Montadinhos. They serve all kinds of tapas-style offerings, and we happened to be lucky to come on a Wednesday, which is one of the two days a week that everything on their menu is 1 Euro. It's mostly mini sandwhiches, but they have an impressive list of of probably close a hundred different kinds, so I do some quick translating for J and we select a bunch to try, as well as a few other things. They even have little sandwhiches with different sweet fillings for desert, served on chocolate bread. The glasses of beer were also a Euro each. The vibe in the cafe was of a younger crowd. This is a university town after all, and we enjoyed blending in with the locals as we ate our lunch. The other thing I found interesting about Coimbra was the graffiti - all available blank walls seemed to be full of political graffiti. Mostly Portuguese, but quite a lot in different languages (10% of Coimbra's students are international, so this makes sense). The quotes were gritty, thoughtful, intellectual, and unapolagetic. I find graffiti fascinating because it gives voice to the inner workings of a city that might not be visible to tourists passing through. It is freedom of expression, and what a city's inhabitants chose to write on its walls reveals something of its soul and character. Clearly, Coimbra has a politically charged student body that you wouldn't necessarily know just from strolling around the historical areas of the campus. My mind's eye saw regal personages having elaborate dinners in the dining halls, heading with towels towards the bath halls; slaves cooking and setting up food for their masters, sweeping the pathways; shop keepers tending to their basement stores. We walked slowly, occasionally reaching out to touch the stone walls, in awe that structures built by people almost 2000 years ago could still be standing, unearthed for us to wander through and experience. I couldn't tear myself away; we could have wandered for hours if we'd had the time, lost in the mists of ancient memories. Portugal, you are not done surprising me. I am falling in love all over again.